Rudolph’s Bar & Tea. All photos courtesy of Freehand. Housed in the historic Commercial Exchange building in Downtown LA, the new Roman & Williams-designed is an original in a neighborhood of rapidly changing needs. When it comes to design, the nearby Ace Hotel Downtown Los Angeles, The Line, and the soon-to-open Nomad Los Angeles may be just as stylish, but none have accommodations that can compete with the very budget-friendly (and chic!) shared bunk rooms at Freehand Los Angeles. With rates as low as a mere $49 per bunk per night, the trendy new hotel is a viable option for travelers of all stripes and price points. Vibe: A cool home base that encourages mixing and mingling with other guests. Standout Detail: In-room amenities like bedding are nicer here than at the Freehands in Miami and Chicago. And unlike the sister properties, this one has room service and attentive porters. This Place Is Perfect For: Free-spirited millennials looking for a place to crash without offending their own design sensibilities. Rooms: The 226 private and shared rooms, including two corner suites, have a casual Cali vibe, with handwoven textiles, sisal rugs, artwork from local Los Angeles artists, and warm wood accents. The Borough Suite is the largest room in the house, with a spacious living room, oversized bathroom, and top-floor panoramic views of Downtown LA. The shared bunk rooms, which accommodate groups of four, six, or eight travelers, have custom cedar bunkbeds with built-in privacy screens and complimentary breakfast. On Site: With 9,000 square feet of event space, including a stunning rooftop pool and deck, the hotel was designed for gatherings of all shapes and sizes. Curated on-property programming includes morning yoga, art exhibits, and live music. A second outpost of Venice Beach-designer Sean Knibb’s is part flower shop, part boutique, and part creative workspace. A 24-hour fitness center and free WiFi round out the hotel’s stellar offerings. Food + Drink: , which features LA’s multi-cultural flavors through an Israeli lens, is led by the team behind Bar Lab and Angeleno chef Alex Chang. , an oasis on the rooftop pool deck, brings the beach to the city with delicious cocktails and small bites. For a quick breakfast, lunch, or beverage, the menu at features fresh, seasonal ingredients, Nicaraguan coffee, and sparkling lemonade. 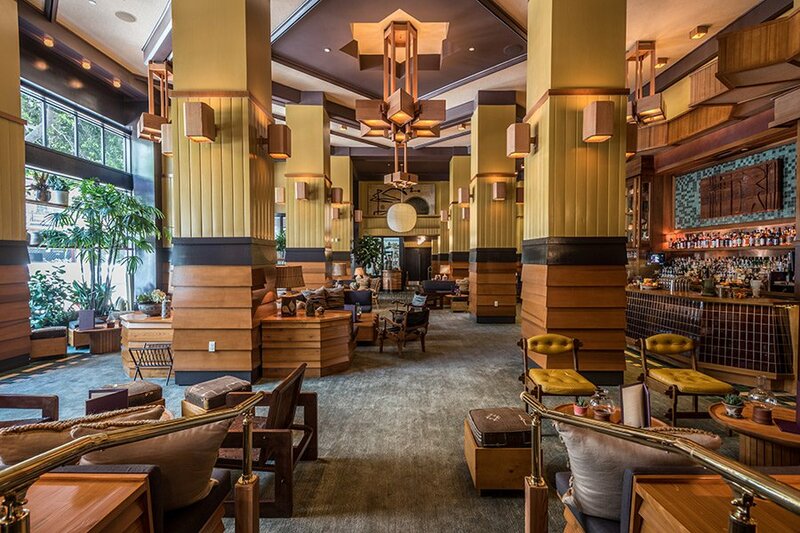 is rethinking the lobby bar concept with a full tea service, tea-infused cocktails, and small plates. A mediterranean-style platter at The Exchange. Downtown LA is in the midst of a major renaissance, with new hotels opening around every corner and an abundance of cool shops, restaurants, and cultural institutions to visit. is LA’s newest and most exciting contemporary art museum and a must-visit for those who appreciate artists like Jasper Johns, Jean-Michel Basquiat, and Andy Warhol. , a downtown landmark that opened in 1917, has a variety of food counters, including (try the namesake dish), , and . Further afield, in the Downtown Arts District, is , a health and wellness center housed in a cavernous mixed-use space with a cafe, boutique, and in-house yoga studio. Nearby, design firm has set up a shop with moody vintage furniture sold alongside lifestyle products from companies like Milla Chocolates and Appointed paper goods.